Sit down, close your eyes and place hands together in front of your chest (prayer position). Focus your attention at the point where the two middle fingers meet. Let go of everything else. If your mind wanders, acknowledge the thought, let it go and just refocus returning to the point where your middle fingers meet. 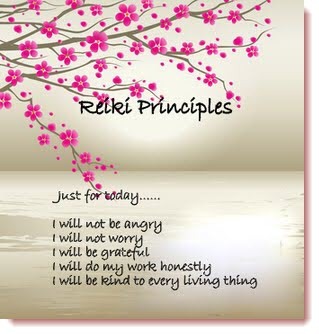 Repeat the five reiki principles either aloud or internally. If you find it uncomfortable to hold your hands in Gassho for 5-20 minutes, simply let your hands (kept together) slowly drop down onto your lap finding a more comfortable position to continue the meditation. You may observe energy in the form of heat, cold or images, just let it go and return your focal point to the tips of your two middle fingers. If you need to adjust your posture; move slowly, deliberately and consciously. It is easier and better to meditate with a straight spinal column, keeping your head still. If you suffer from back problems or find it difficult to sit still; try sitting on a straight back chair with a few pillows for comfort. Alternatively, you can sit on the floor on a few cushions with your back against a wall. You could even meditate while lying down or a sofa or bed, but you may find you fall asleep, which at night is OK, but in the morning, could leave you late for work or other engagements.